The original CenTradeX Trade Intelligence platform was developed over a three to four-year time frame from Spring 2000 to Spring 2004. Initially, we focused on bringing a host of value added features to statistical U.S. import and export data from U.S. Census. Thereafter, we layered and connected this U.S. centric data with global import and export data (from U.N. Comtrade) on approximately 190 countries. 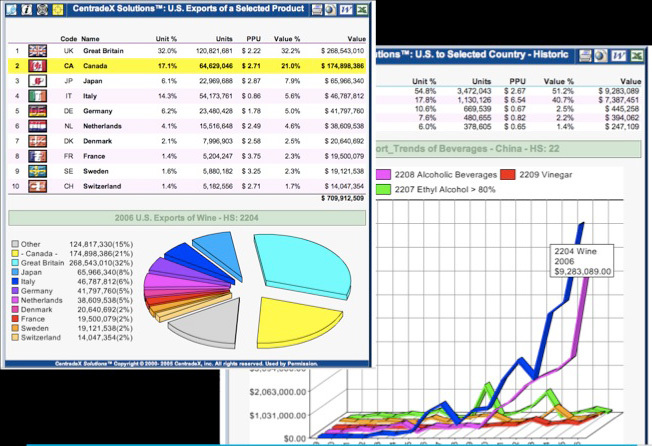 In time, we also incorporated U.S. state export data into the mix. Surprisingly, no one had ever layered these data sets together before. 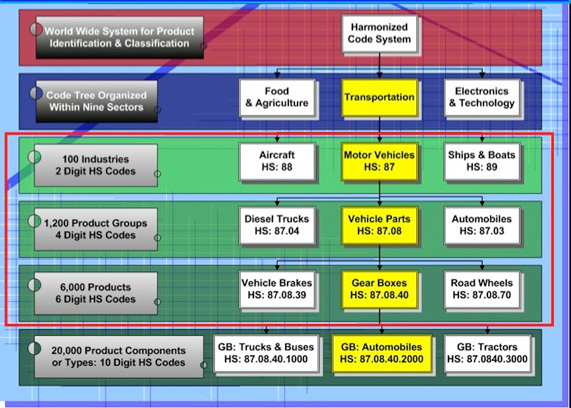 HTS (Harmonized Tariff System) Classification schema. The essential “language” of international trade statistics. Atop these statistical data collections, we crafted a graphic, interactive interface wherein users after selecting an “X” product vector (one of the 6,000 Harmonized System product classifications) and a “Y” location vector (one of 200 countries listed) were (almost) instantaneously presented with dozens of dynamically created reports representing many perspectives pertaining to the intersection of their choice. Over a billion unique reports could be potentially generated by the system. These included historic analyses spanning 20 years, trends 1, 3, 5 years into the future, contextual reports for the respective region and industry, competitive analyses, product/industry segmentation and trending, etc. 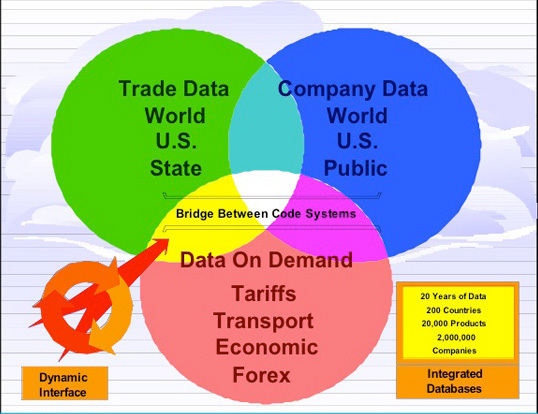 One economics /international trade professor remarked that the system made “data dance”. Market testing and resulting feedback, compelled us into the task of finding and incorporating company data – both foreign and domestic – toward the objective of uncovering the actual traders behind the statistics. Economics and trending with numbers is one thing… pinpointing buyers and sellers is quite another. Consequently, we apprehended and assimilated the best known company sources (at the time) including; Kompass, Harris Info, Hoovers, D&B, PIERS and others. One of the most challenging aspects was that statistical data is organized under one (HTS) classification schema while company information is organized under other (unrelated) systems (SIC, NAICS, or a vender’s particular proprietary taxonomy). However, after successfully tackling that enigmatic brainteaser, we were able to incorporate other data sets, tariffs (for all countries and products), estimated shipping costs (from four U.S. port regions to any /all countries), foreign exchange as well as our clients’ proprietary data collections and others… with relative ease. By far the most arduous of our data transformation and enhancement endeavors was to understand, normalize and intelligently incorporate U.S. Customs data into this dynamic mix. ALL OTHER purveyors of Customs data started the other way around. Some (the best) have consequently connected some other data elements. Most notable among the few is PIERS, who several years back contracted with D&B to “tag” their data collection of U.S. Importers & Exporters. Datamyne is presumably undertaking a similar process now. Panjiva has connected with reasonable success many other vendor’s data pertaining to foreign sourcing. To my knowledge, at the present, no others have made those necessary connections. Zepol has begun offering statistical data, but not connected to Customs data. They remain in separate unrelated silos. Suffice it to say, there are still significant vistas to explore and develop. The 45 second video (slide show) below is an irreverent depiction of what many users have reported experiencing when trying to find solid “trade intelligence” amidst the seemingly endless sea of Customs data obscurity.